It’s dinnertime. You have leftover spaghetti but not enough to feed the family. What to do? 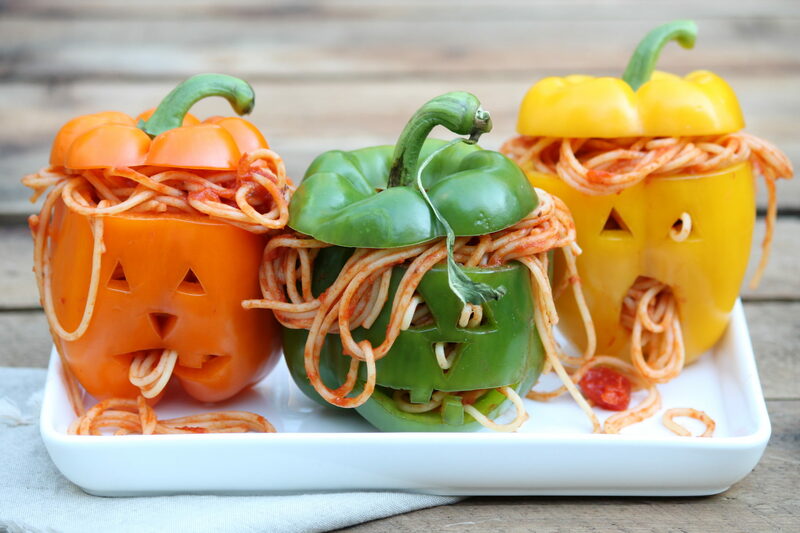 In mid-October, “spooky” spaghetti stuffed peppers are sure to delight. I saw this silly idea years ago but forgot about it as several Halloweens came and went. Then, while shopping at Central Market last fall, I spied an array of colorful bell peppers and the memory came back. I couldn’t resist. As I hunted for peppers that had a nice flat side for “carving,” I mentioned my dinner plans to the standholder. Fully on board, she, too, began scanning the rows for ideal specimens. As we laughed, I remarked that this was, in fact, a rather strange request. She said she’s accustomed to oddball requests…although this ranked up there! The best part is that no special recipe is required. Simply slice off the tops of the bell peppers and reserve them for lids, then scrape out the seeds. If the peppers are a little wobbly, slice a thin piece off the bottom to help them stand a little straighter. 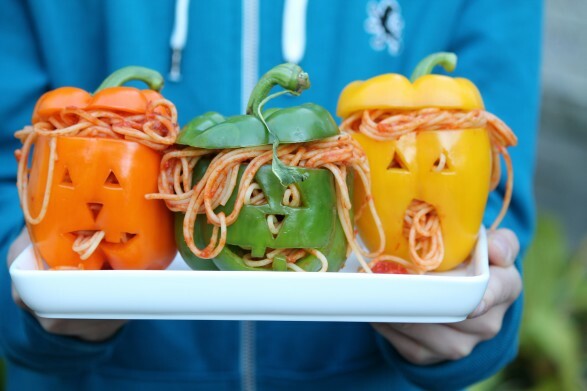 Have fun carving spooky or silly faces on the peppers and fill them with your favorite spaghetti recipe, be it freshly made or last night’s leftovers. 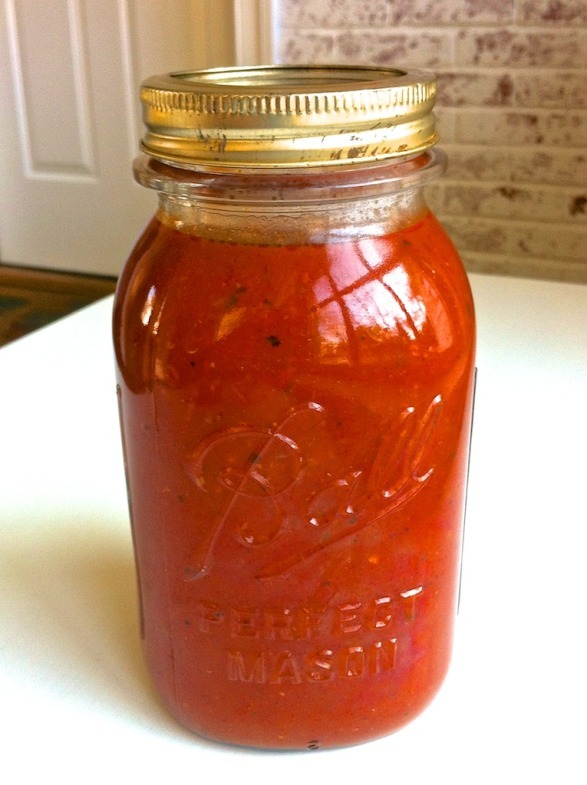 For those preferring homemade sauce, simply click on my go-to recipes for Basic Marinara and Slow Cooker Spaghetti Sauce. Of course, your favorite store-bought sauce is fine. To soften the hollowed-out peppers prior to stuffing them, they may be precooked in the microwave or oven. Alternatively, bake the stuffed peppers at 350 degrees for about 20 minutes or until tender when pierced with a sharp knife. My boys deem a cooked pepper “mushy” and merely scoop out the spaghetti. So, I simply stuff warm spaghetti into the crunchy, raw peppers and they happily eat every last bite. Texture can make a difference, and those with picky eaters may find similar success. After you put the lid back on, make sure to pull a few strands out through the various holes you have cut. Oozing brains and guts are essential! Truth be told, my husband enjoys this wacky meal as much as our kids do. It’s fun and easy–with the veggies built in–and guaranteed to bring laughs at the dinner table. 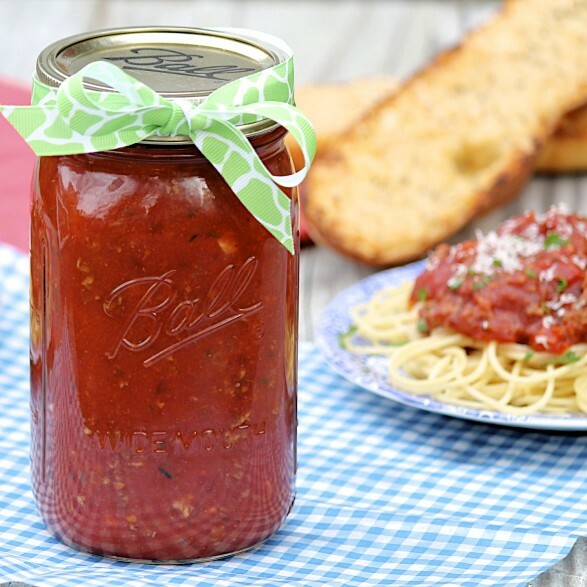 For a deliciously easy sauce, try the following recipe for Slow Cooker Spaghetti Sauce. 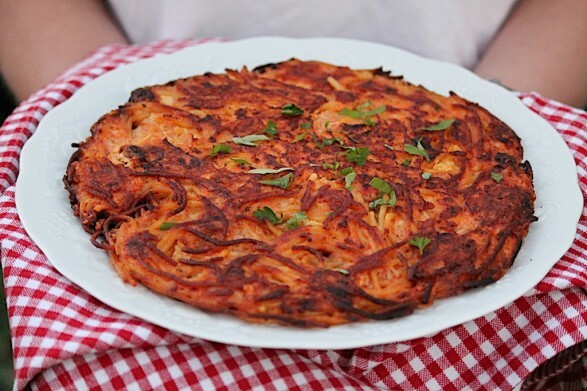 …and to stretch a little leftover spaghetti into a fun and tasty meal, consider this recipe for Leftover Spaghetti Pizza. Basic Marinara is yet another sauce option. I often freeze portions of this sauce to use in a variety of easy dinner recipes. Those recipes are linked on the marinara recipe post. So cute! Grace would love these!!! Boo! The stuffed peppers were a huge hit last night. Making more spaghetti for neighborhood Halloween party on Friday. That is great to know, Tina. So glad they were a success!